The Elder Scrolls Online: Tamriel Unlimited has been hit with release day server issues. 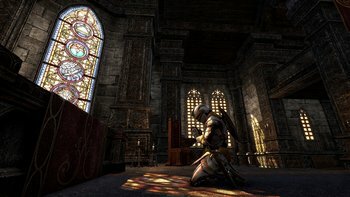 Community Coordinator: "We will continue to work on this until it's resolved for all players..."
Since servers went live early this morning many European and North American gamers hoping to be launched into The Elder Scrolls Online: Tamriel Unlimited have instead been greeted with an error screen reading "Login Failed. An unexpected internal error has occurred. Please contact customer service." For the past few hours the studio has been working to fix the issue, providing updates along the way. While some players are able to get online, others are still having difficulties - and in one case, both types of players were in the same room as one another. "Hey everyone. If you have been experiencing login errors, we ask that you please try to log into the console megaservers again," Community Coordinator Jason Leavey wrote. "While we are continuing to work on resolving the issue, we have found that the issue has been fixed for some players at this point. We will continue to work on this until it's resolved for all players, and we'll provide an update when we can. Thank you again for your patience throughout the night." Many have referenced the short beta testing period for The Elder Scrolls Online: Tamriel Unlimited, which held a limited console beta testing from April 23 to April 27. Several players who are able to log on are reporting issues with disappearing NPCs. But, as one fan said of the issues, "Expecting no problems on an MMO launch day is like expecting someone to admit fault when you rear-end them. You're gonna end up disappointed."